Sens. 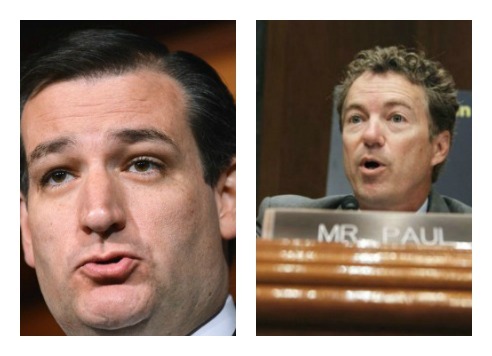 Ted Cruz (R-TX) and Rand Paul (R-KY) lead an online Tea Party presidential poll while Republican New Jersey Gov. Chris Christie comes in dead last. Former Florida Gov. Jeb Bush is second to last with former Utah Gov. Jon Huntsman, the failed 2012 GOP presidential candidate who is now associated with the conservative-bashing “No Labels” group that is a refuge for those in the bipartisan permanent political class. The Washington Examiner reported that grassroots conservatives also strongly support Dr. Ben Carson, former Alaska Gov. Sarah Palin, and Wisconsin Gov. Scott Walker. Cruz has the support of 84% of those polled online. Paul got the support of 80%. Christie got the support of 15% while Bush and Huntsman received 29% each. Cruz has led in a recent Washington Post/ABC News poll among Republican GOP presidential primary voters that consider themselves Tea Partiers. Among all Republicans in a recent national poll, former Alaska Gov. Sarah Palin still had the highest favorability rating even though she was not included in the list of potential 2016 candidates on the survey, which means that her endorsement, if she does not run, could potentially tip the 2016 nomination contest that is expected to be wide open without a clear frontrunner.